Twitter is rolling out a new feature that allow brands to tweet deals, which users can claim online and redeem in stores. Twitter Offers is the messaging network’s second step into e-commerce, after trotting out a buy button for tweets over the summer. Twitter is working with major retailers, chain stores and small shops that will tweet messages with a new offer button, promoting deals much like the ones you find on Groupon. 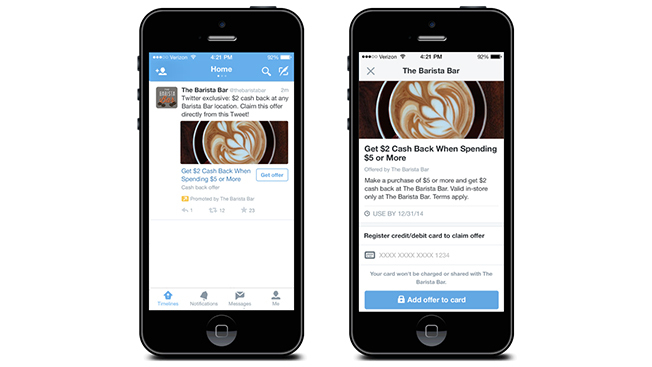 The first example Twitter showed off in its announcement today was a deal for $2 off any purchase of $5 or more at The Barista Bar in San Francisco. "We're planning to work with a handful of brands to begin testing this new feature during the holidays in the U.S.," Twitter said today in a blog post. The ability to tweet deals also lets brands track the effectiveness of their ad strategies on Twitter. Advertisers can target their campaigns and tailor the messages based on the audience, and then see the outcome once the deals are redeemed in stores. Users have to link their credit or debit cards to their Twitter accounts, and then click the offer button to accept the deal. They pick up the discount when they pay with the same bank card in the store with their bank card.